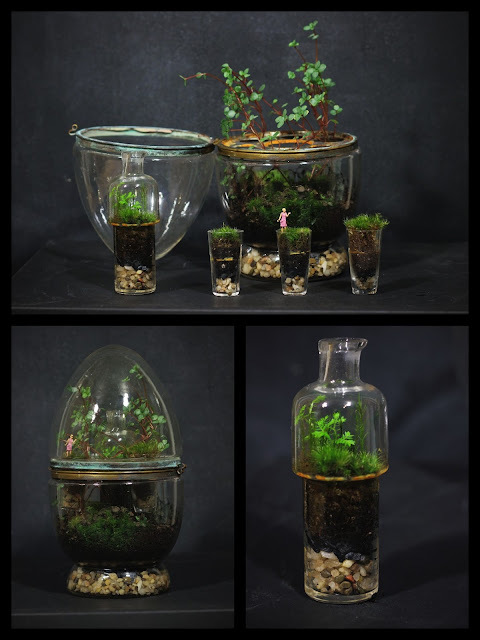 Josh Leo at Eight Oaks Terrariums shared a link to his truly one-of-a-kind cave á liqueur terrarium. We've seen terrariums in wine bottles, vodka bottles, tequila bottles - but a cave á liqueur? What is a cave á liqueur? "A cave à liqueur is a liqueur caddy that has diminutive crystal liqueur decanters (typically 4) along with a set of small glasses (typically 8)." Aha! A tempting transparent liquor locker - which has been repurposed into a fantastic terrarium and a convenient obscure history lesson in one! Kudos to Josh for continuing to push the boundaries of the terrarium art form.